Designed specifically for the FBI, the 40 S&W is one of the best self defense rounds out there. When the FBI had this round designed, they wanted something with penetration, stopping power, and manageable recoil, all of which are provided in the 40 S&W. This caliber is not only fantastic for self defense, but is also a great range and target shooting round. Winchester has been around longer than almost any other ammunition manufacturer in America, and with great age comes great ammo. 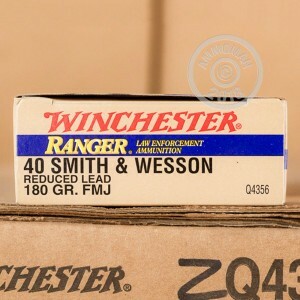 These Winchester Ranger rounds were designed to give you the same high performing, reliable ammunition that you expect from Winchester with less lead. 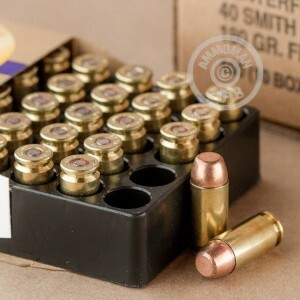 Each cartridge in this box of 50 is loaded into a boxer primed brass casings that is re-loadable. 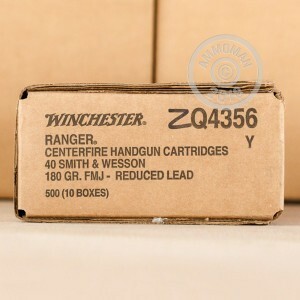 When you pop these 180 grain, full metal jacket rounds into your favorite handgun, you will experience the high quality of Winchester at the range. Don't forget, at AmmoMan.com all orders over $99 will qualify for Free Shipping!